English: The Delaware Bay — a major estuary outlet of the Delaware River on the Northeast seaboard of the United States. A wetlands Ramsar site in the United States. 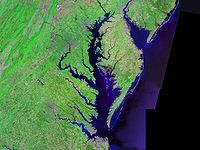 Español: Bahía de Delaware — del río Delaware, en Nueva Jersey y Delaware. Es una bahía del océano Atlántico. Media in category "Delaware Bay"
This page was last edited on 11 February 2019, at 05:16.